When a massive tsunami struck Southeast Asia in December 2004, Dr. Martina Fuchs was a Los Angeles-based pediatrician. She had never dreamed of traveling to a disaster zone halfway around the world to set up a clinic—but when she saw the parallels between the children who had lost their families in the tsunami and her own young nephew and patients, she decided to go. The clinic she established in southern Sri Lanka in 2005 became a site for community healing and the birth of Real Medicine Foundation (RMF). Since then, RMF has expanded its humanitarian work across four continents, guided by the belief that real healing encompasses the whole individual and empowers entire communities. Given RMF’s origin story, I wasn’t surprised to see that there is already a team in Haiti spearheading Hurricane Matthew relief efforts. Can you walk us through what your team did in anticipation of the hurricane and what their current focus is in the aftermath? In general, how do your teams prepare for natural disasters like this? There are two different scenarios: one when we already have a team in the country, and one when we start new. For Hurricane Matthew, we already had a team in Haiti, where we started to work after the 2010 earthquake. We have ongoing programs, so in situations like this, we look for what is needed most and how we can support communities with our existing structures and available funding. In Haiti, what’s often happened is that well-meaning people and organizations come in with things that they think will help, but they actually obstruct the chain of supplies or support. Unfortunately, the response after the 2010 earthquake was not very effective, and people are still suffering. A lot of money is still sitting in accounts and never got to the people. One of our approaches is always looking to see what the community states they need, and how we can match that. This is what I firmly believe: in every single country, it doesn’t matter how poor, there are amazing people whose skills and insight you can build on if you listen to them. This is how our organization is set up. We only hire nationals in the countries where we work. We empower our teams and the communities we are supporting to take the lead. As a brief background on Haiti, we met our program director, Dr. Patrick Dupont, because he is the orthopedic and trauma surgeon who used to run Centre Hospitalier du Sacré-Cœur (Hôpital CDTI) until it had to close several months after the earthquake. It was the best hospital in the country and treated thousands of patients injured in the January 2010 earthquake. About 75 patients were treated in CDTI’s courtyard for several months because they weren’t sure if the hospital was damaged or if it was dangerous to be inside. 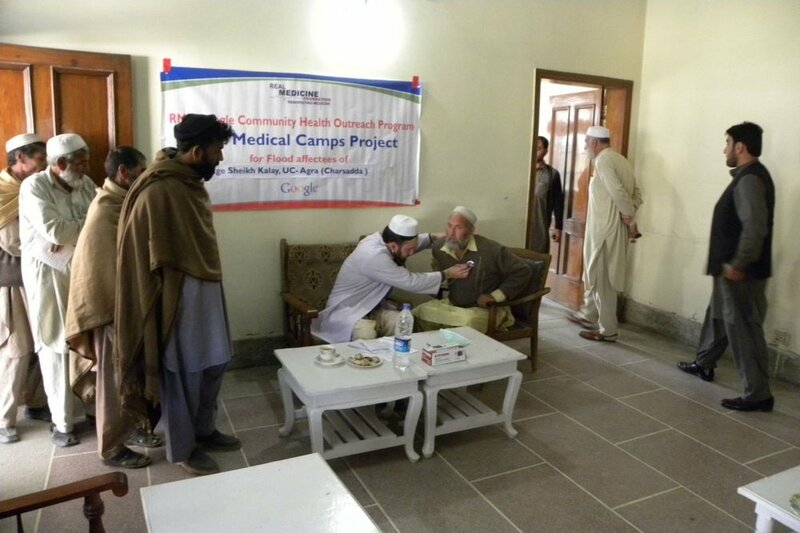 The owners provided their own funding for the patients’ treatment and since there was no additional support, i.e. from the government, eventually CDTI had to close. RMF supported operations at CDTI following the earthquake. We also established several clinics that we then gave over to local management, and we ran a free surgical clinic at Hôpital Lambert Santé for several years. Patrick continues to lead our long-term programs, such as our ongoing surgical program that treats children with complicated orthopedic issues, several of them consequences of surgeries they went through after the earthquake that had not been performed correctly. For Hurricane Matthew, this is the structure we are building on. One of the main issues in Haiti is access to secondary and tertiary care, so that’s our main focus right now: to support trauma victims, logistically transport them to Port-au-Prince, and help them return home after treatment. Surgical/orthopedic cases are usually complicated because they require longer-term treatment and physical therapy to ensure everything heals correctly. We were also just asked if we would support cholera treatment, which takes place at specific cholera centers because of the isolation required. So we are probably going to support existing centers and connect them to our ongoing outreach. That’s what it looks like right now, and this can be scaled up at any time. You described how well-intentioned organizations can sometimes end up getting in the way. What kind of practical, strategic advice do you have either for individuals or organizations who want to jump in and lend a hand? The most important is asking and listening, always. What I’ve learned is that immediately following a disaster, nobody knows what the situation is. After Hurricane Matthew, many news outlets used photos from other previous disasters. It’s impossible to know the extent of the destruction and human toll, and if anybody says they know, they are not honest. Following a natural disaster, it’s such chaos that it takes days, if not longer, to understand the situation. For example, after the April 2015 Nepal earthquake I remember waking up Saturday morning, April 25, to calls from our India team, knowing that Nepal was where we would work next. The RMF team and I tapped into our personal and professional networks for contacts in Nepal. Then I just started calling hospitals in Kathmandu until I got a doctor on the phone and could ask concrete questions about what they needed most. They said, “We have enough human resources—we don’t need doctors. We need shelter for the patients. We need supplies for surgeries, medicines, equipment.” They were very concrete, but many organizations just flew in teams of doctors that nobody really needed. There were also campaigns by well-meaning clothing corporations, even though the clothing they sent was not culturally appropriate. It’s so simple: Ask the people and listen to their answers. When I give talks, I often explain it this way: I’m a doctor. I’m pretty educated and I know what I need. I live in Los Angeles and we could have an earthquake or a tsunami anytime. If I’m in a disaster, that doesn’t mean I have changed who I am and what I need as a person, and I believe that this is the case for everybody. So that’s our approach: asking the community, giving them the respect and dignity you would give to friends. In a disaster, there is chaos and there is fear, but listening to the people and to the community works every time. RMF likes to position the hospital as a “hub,” which is a novel way of defining it as a community-maker, rather than a community resource. Could you talk about how a hospital can exceed its role as a resource to become a place from which a community can grow? For me, it’s very much based on what I saw in hospitals working as a pediatrician. What we mean by “real medicine” is medical/physical, emotional, social, and economic support for the whole person. Healing has to have all components. Sometimes healing is medication. Sometimes it’s money to get someone back on their feet. Sometimes it’s vocational training. Sometimes it’s making sure that your children are back in school. So what we believe is that once you have survived and you are healthy and your children are in school and safe, then you can focus on your economic livelihood again. That’s how you become independent. I worked in Sri Lanka after the Indian Ocean tsunami and helped to establish a small clinic in one of the refugee camps in the south. At first I thought, “I have never done this before. I trained in Europe working in high-tech hospitals. I’ve never set up a clinic in a refugee camp before.” But then I just asked myself, “What would I need to function as a doctor?” And the answer was simple: a building, safety for the patients, guaranteeing the patients’ privacy, an examination table, medicines, and medical supplies. Once we were set up, many people came for me to just listen to their chest because they had swallowed tsunami water. When you just swallow ocean water, nothing harmful happens, but my translator explained that people came to him and said, “Since Martina is here, we are feeling safe.” In situations like that, you don’t need to do tertiary care. You don’t need to do complicated heart surgeries. You just have to be there and show that you care. You have to treat people with respect and dignity, and allow communities to take ownership. That’s what creates a hub—that sense of safety. How do you strike a balance between establishing a clinic, which can tax community resources, and positioning it as a source for capacity-building and economic liberation? You know, it somehow happens automatically. I always look for impact. I look for how many people we can reach. I’m very focused on quality first, which is what we have done from the very beginning. If you take care of one child at a time, you reach the big numbers automatically, but quality of care should always be the priority. We started to upgrade and renovate Lodwar District Hospital in Turkana, Kenya in 2011, the only hospital for a million people. We did infrastructure upgrades to create a healing environment, starting with the basics like painting, beds, mattresses, mosquito nets, and then providing medical supplies, medicines, medical equipment, operational support, and advanced training. As word of mouth spread, the number of patients doubled and tripled. Additionally, because we provided equipment like nebulizers and oxygen concentrators, children who previously died of bronchitis or pneumonia were cured. The patients’ mortality decreased significantly because treatment was available. When hospital stays are shorter and people are cured, word of mouth spreads. There is nothing you need to do. In many developing countries, there are hospitals with incredibly limited human resources, very few supplies, and little to no medicine or equipment, so the community perceives the hospital as a place where you go to die. If you supply a hospital, set it up, make it operational, and focus on quality, you create a significant impact. It seems that quality not only attracts people, but can also mitigate the amount of labor that goes into treating patients. Exactly. That happened in Lodwar. Once we started our support, it became a training and teaching hospital within a few months, and was officially recognized by the Ministry of Health as the best pediatric facility in the region. This is a model for secondary and tertiary care, which is also one of RMF’s niches. Many organizations focus mainly on primary care, especially in developing countries, which means that if you have a more complex medical issue there is nowhere to go. So it has been exciting to do this on a larger scale and see what’s possible. We have supported Juba Teaching Hospital in Juba, South Sudan since 2013. We are still supporting that hospital and several other hospitals around the world, but it started with Lodwar. I can see that RMF focuses on long-term, sustainable initiatives. The 2014 annual report included a critique of “quick-fix fads” in global medicine that allow “people to feel they are fixing the problem of poverty without ever having to confront power, or challenge the tenets of the prevailing economic order.” Can you unpack this? How do you know a “fad” when you see one? How does RMF challenge and spark change in the prevailing economic order? It comes back to asking and listening, because the people who do these quick fads are often doing it for themselves. It’s not really about the patients. They want this proud moment of giving laptops to kids, for example, but they don’t consider that there’s no electricity or Internet access. So much of humanitarian work is from the outside-in. A paradigm shift to an inside-out approach takes humility and time to listen. You also have to examine the structures. If you look at numbers, you’ll see how much money actually goes to the programs and how much goes to salaries, overhead, or flying first class. I came into the humanitarian sector just 11 years ago, with founding RMF, and sometimes it’s hard to understand that there is so little focus on capacity building. It’s important to examine the intention and the values of any initiative. We have this amazing team in South Sudan. It’s all South Sudanese nationals who are so committed to their new country, but the government and the military have just been pulling millions and millions of dollars out of the economy. A large percentage of the population is without food. Millions are displaced. In addition to that, if you look behind the scenes, there are many that are not really interested in having countries like South Sudan succeed, because there is more money to be made in instability. If you work in such a corrupt, chaotic situation, you’ll find that many organizations work parallel to, not with the government. Then when they exit, no capacity has been built. I don’t believe in parallel structures, because if you want to create new models, you have to connect with what is there right now, and you have to find ways to communicate. It’s not easy, but it works. That’s why we are so particular about the people we hire—people who want to contribute to something bigger than themselves. You don’t find them on every street corner, but you find them everywhere—in every country, every religion, every culture. You approach your with such optimism and faith in people, which I imagine is necessary when you do this kind of work. It can be draining to sit and wait for the next disaster. What gives you hope? What gives me the most hope, and what I’m so proud of, is our teams around the world! Our team leader in South Sudan is South Sudanese. He grew up in a refugee camp. In this most recent war, several of our team members’ residences have been looted or burned, but there is still commitment. This inspires me every day. You cannot do this work if you don’t love it. For me, RMF is not just an NGO. I want this to be a movement, a paradigm shift in humanitarian work and development, building capacity for long-term sustainability. Our leadership in the countries is so strong, and they have internalized our “Why,”—‘Liberating Human Potential’—and our values of respect and dignity. I see how they hire new people and new leaders, in alignment with our values. If you keep multiplying this, you create a network, and at a certain point it reaches critical mass. That’s what gives me optimism. For some reason, the planet right now is in the state it is in. Sometimes it’s frightening to see what we do to each other as human beings. But as I said, the people that we connect with in the organization give me hope. The blessing is you find them everywhere on this planet. You just have to look. Learn more about Dr. Martina Fuchs at realmedicinefoundation.org. No Replies to "LISTENING IS THE REAL MEDICINE: SCALING GLOBAL HEALTH INITIATIVES"